You will find all sorts of inspiration at Babipur for ethical, sustainable and beautiful gifts this Christmas. Whoever you are looking to get a thoughtful gifts for this Christmas, we can help you find something that extra special that will be loved all year round. Here are some of our top picks for toddlers who are ready to explore and discover. Watch little eyes light up as they pull along this magical toy train. As your child pulls the train along, the engine moves independently and the little ball rolls round in the carriage. Your toddler will have plenty of fun taking the train apart and putting it back in order. 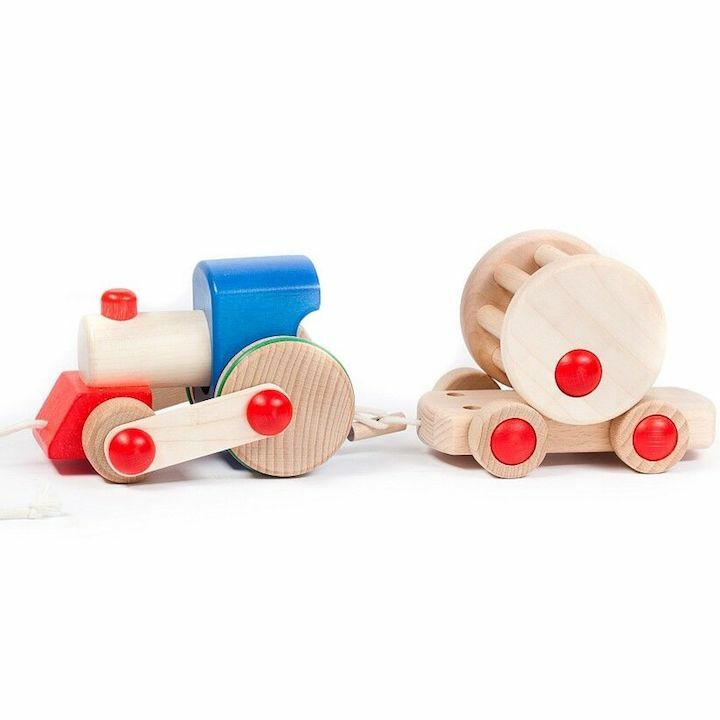 Made from sustainable wood, this gift is perfect for all your transport mad tots! 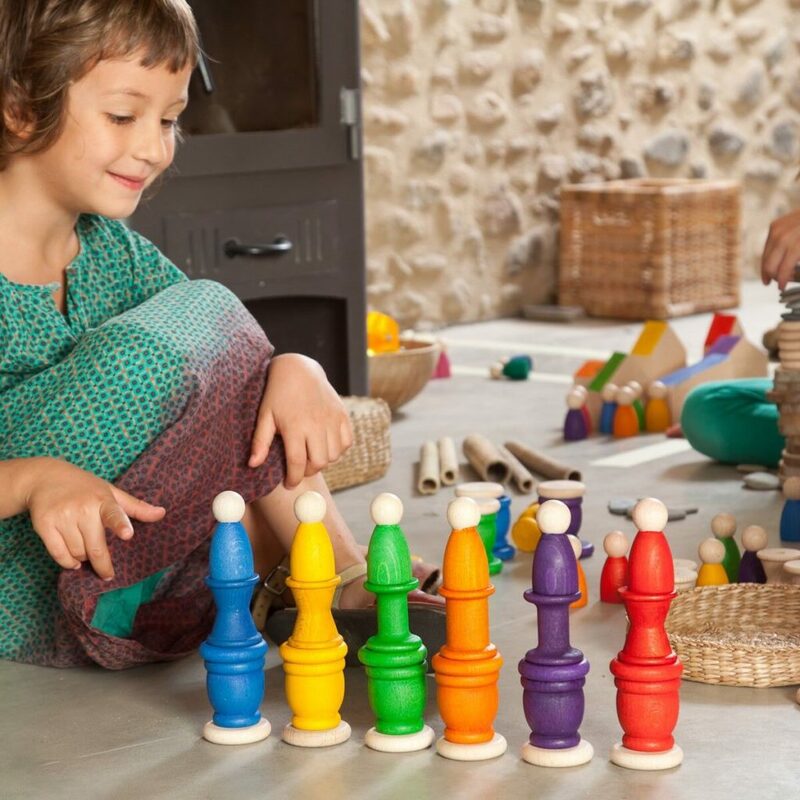 Bajo makes beautiful and tactile wooden toys. Sustainably made in Poland from beech, birch, sycamore, acacia, cherry, walnut and plum trees, sourced in thoughtful ways. The toys are treated with eco, non-toxic paints and oils and so safe for little hands to explore. We are big fans of Plan Toys here at babipur. 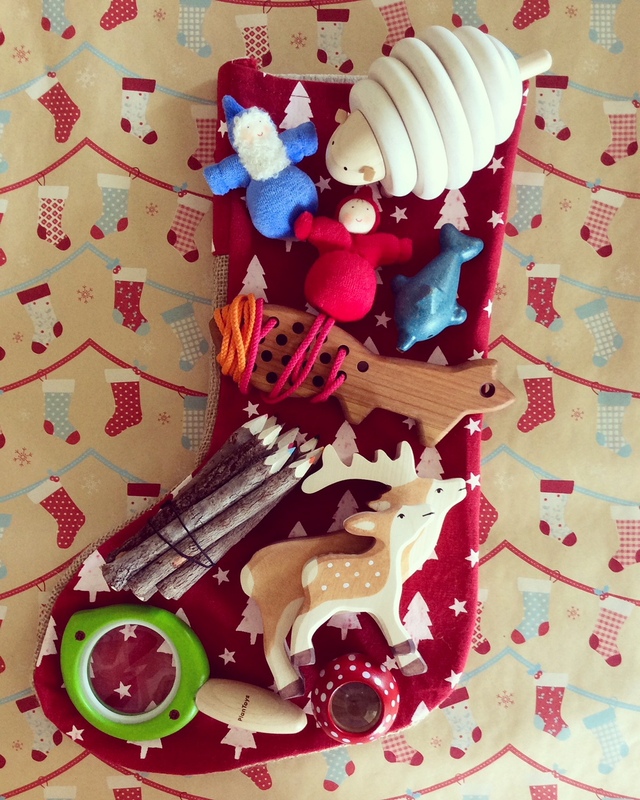 Made from sustainable material, your children are bound to love these toys for many years to come. 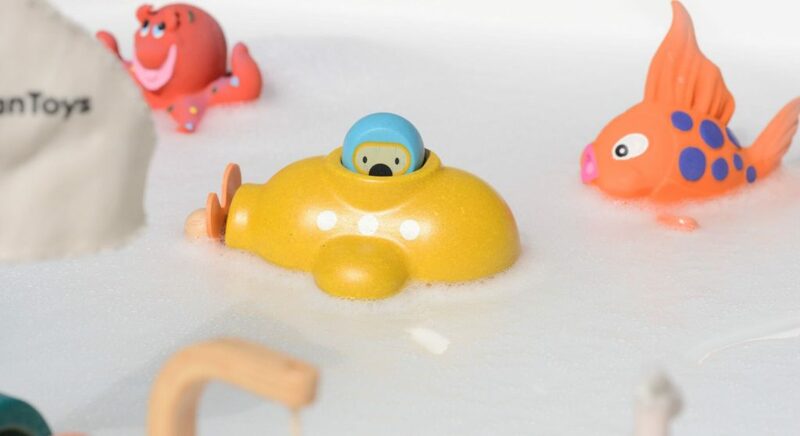 Bath time is definitely more fun with this cute little submarine, perfect for any Octonauts fans out there! Kids will love splashing around and creating new adventures, perfect to let your imagination run free. 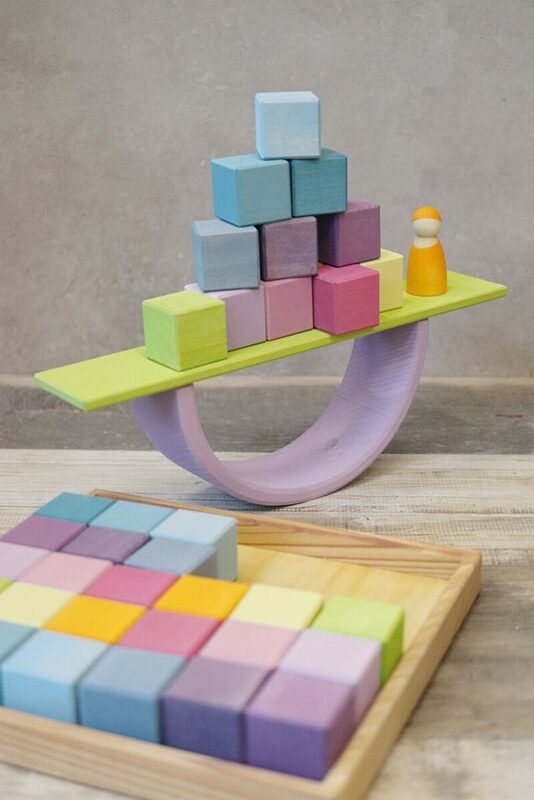 These wooden blocks are smooth, tactile and perfect for open ended play. Stack them, create with them, make pictures and patterns, use for counting, the possibilities really are endless. These blocks come in a neat little tray, perfect for keeping tidy and using as a flat surface for building on. Grimm’s toys are inspired by the Waldorf Steiner education movement and inspire thoughtful and creative play. Allow your child to explore their toys and connect with the world around them at an unhurried pace. Grimm’s source their wood from sustainably managed European forests and their natural beauty has to be seen to be truly admired and appreciated. Available in pastel and bright block sets. Beautiful Grapat. 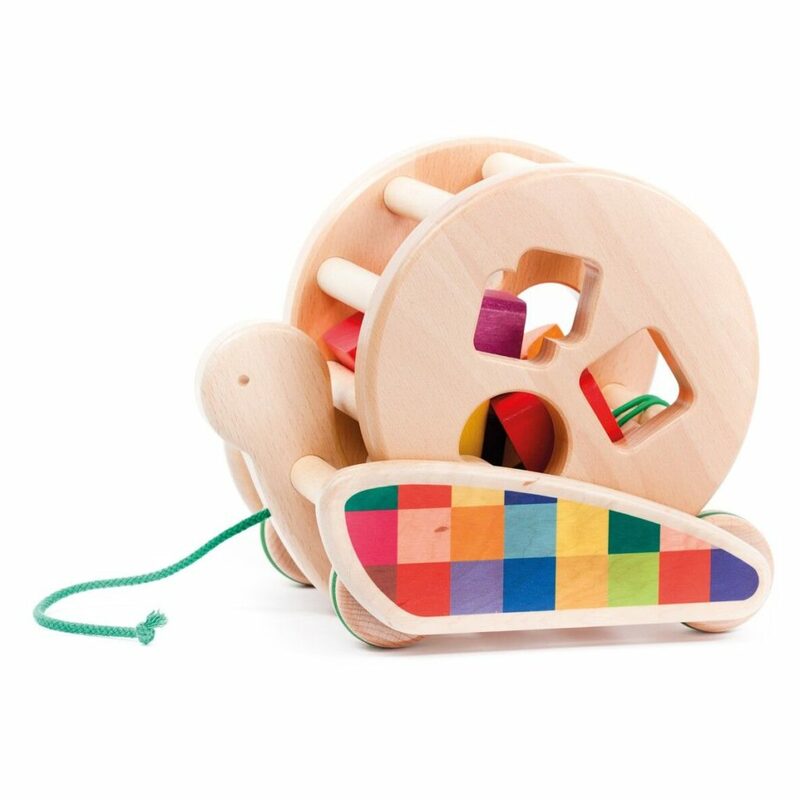 You will instantly fall in love with the textured wood grain, vibrant colours and natural feel of these open ended toys. Perfect for stacking, sorting, counting and creating a small world where the your imagination can be set free. Be amazed by how your child is captivated with the simplicity and freedom these toys allow. Inspired by nature and their surroundings, Grapat believe in freedom to explore. Made with wood from sustainable and local sources in Catalunya, finished with water based colour stain that is safe for children to explore. 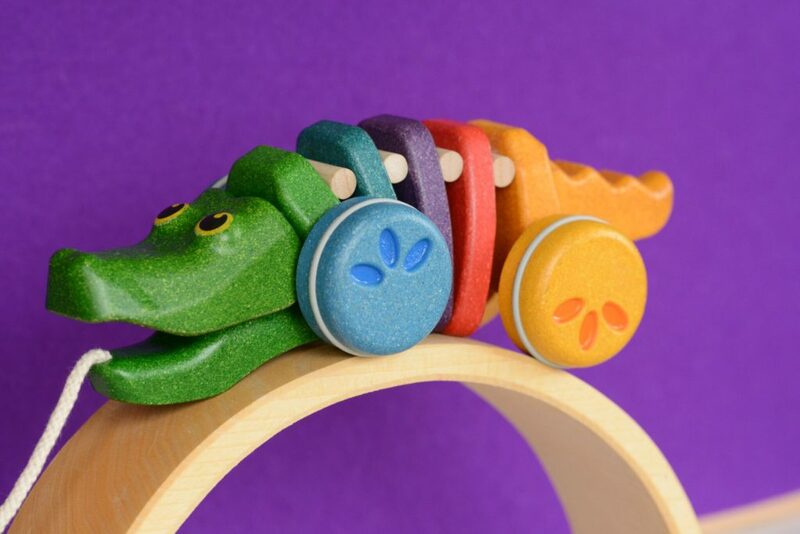 This rainbow alligator makes the perfect friend for toddlers to pull around. The Plan Toys classic green alligator has become pretty famous so the new rainbow special edition was always bound to be a big hit! Only 1,000 of these have been made so you will want to be quick to grab one of these beautiful toys. Little ones will be transfixed by this friendly snapping alligator as it click clacks moving along the floor. Also available in classic green. 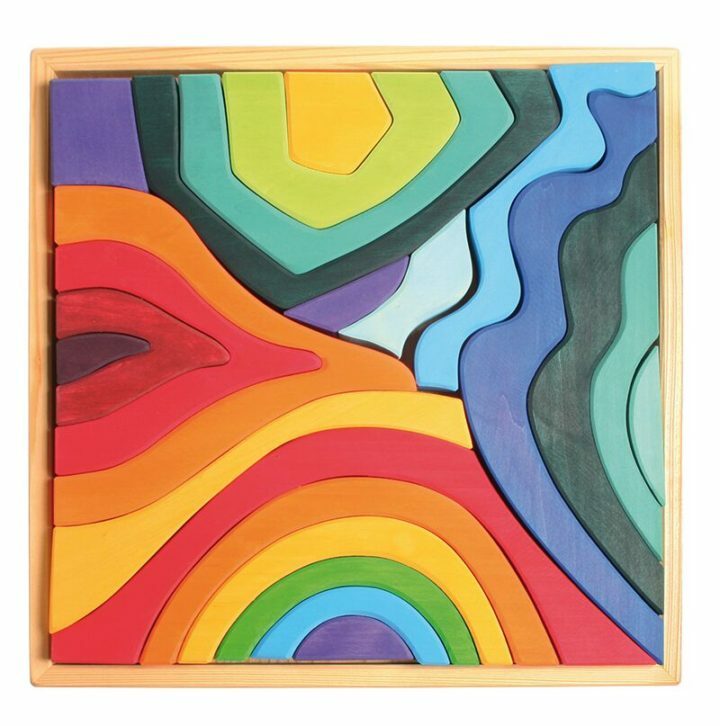 This vibrant and stunning elements puzzle combines the elements of earth, air, fire and water. It combines four classic open ended Grimm’s toys, the cave, rainbow, flames and waves in this beautiful set which is contained neatly in a building board. It will make a beautiful addition to any playroom or play setting and is perfect for creative open ended play. Watch your child develop their creativity whilst exploring with this set and learning problem solving and spatial thinking as they play and have fun. The Grimm’s classic 12 rainbow friends have now been released in cherry wood for a deeper, richer wood effect. 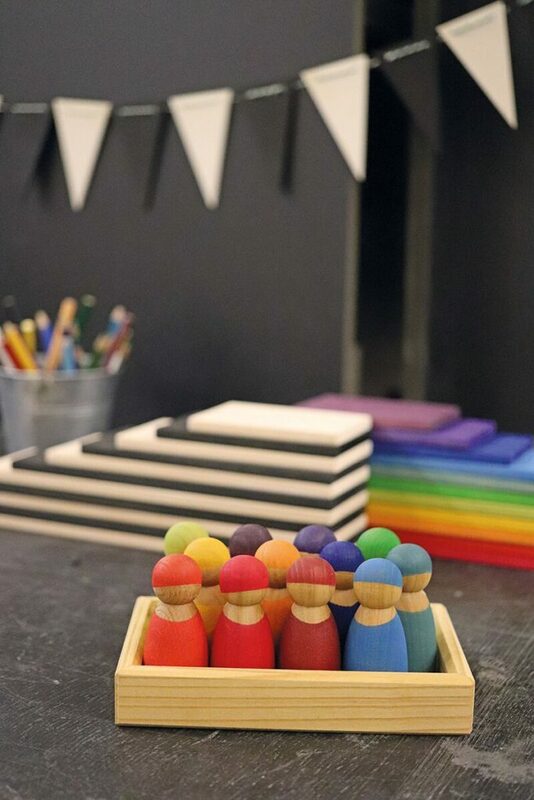 Cherry wood has a velvety texture and small hands will love to explore these simple and tactile toys. Encouraging open ended play with peg dolls, supports children to learn essential communication skills such as kindness and social interaction. It provides the freedom to explore and create whatever their imagination allows. Also available in the original rainbow friends set. 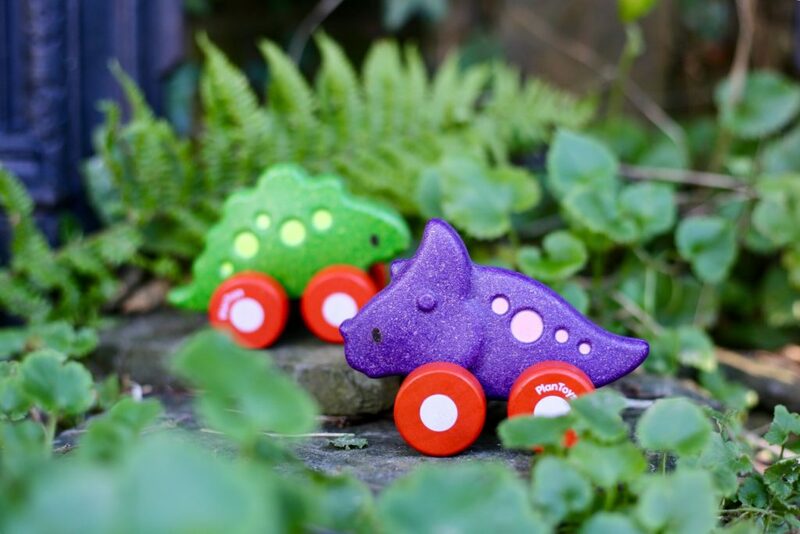 These cute dino cars from Plan Toys are perfect for little hands ready to adventure and explore. Watch as they whizz along and bob up and down. They are super speedy!! Perfect for developing fine motor skills and encouraging imaginative play. Bajo have combined two classic toys to make this cute pull along snail shape sorter. Older babies and toddlers will just love playing with the six coloured shapes and pulling behind as they toddle around. Perfect for learning shape recognition and developing hand eye co-ordination . Last but absolutely not least, is the fantastic Wobbel board! If you haven’t already heard of Wobbel (and fallen in love), they are the creation of Dutch Duo Hannelore & Wouter. Designed to entice and encourage movement and creative play, the Wobbel is a hit with children and adults of all ages.